Stevenage made it 16 points from a possible 18 after a 2-0 win at York. Adam Marriott and Tom Pett scored as the visitors extended their unbeaten run to a sixth game. Home keeper Bobby Olejnik brilliantly denied Pett, before Marriott headed in a loose ball after Charlie Lee's first-half volley had come back off the bar. 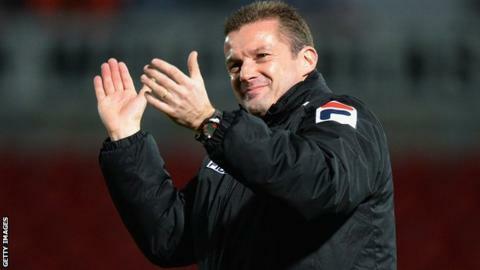 Graham Westley's men doubled their advantage shortly after the hour-mark when Pett found Olejnik's top left-hand corner from 30 yards. "Not good enough, that's the bottom line really. "I feel for the supporters. The last two home performances have been outstanding, but today we just didn't perform. "The lack of quality today was eye catching - we just looked lost and it was a really bad day." "We knew it wasn't going to be an easy trip, I thought the players did a good solid job. "In the second half I thought we got right on top of the game and kept the ball in their half." On Tom Pett's goal: "It was an incredible strike, he's growing and growing. He was a non-league player this time last year. "Our budget is spent so we'd have to move players out to move players in." Match ends, York City 0, Stevenage 2. Second Half ends, York City 0, Stevenage 2. Corner, Stevenage. Conceded by Anthony Straker. Attempt saved. Jake Hyde (York City) header from the centre of the box is saved in the top centre of the goal. Dean Parrett (Stevenage) wins a free kick in the attacking half. Brad Halliday (York City) wins a free kick in the attacking half. Russell Penn (York City) is shown the yellow card. Corner, York City. Conceded by Chris Day. Attempt saved. Carlton Morris (York City) right footed shot from the centre of the box is saved in the bottom left corner. Adam Marriott (Stevenage) wins a free kick in the defensive half. Attempt missed. Jake Hyde (York City) right footed shot from the centre of the box is just a bit too high. Carlton Morris (York City) wins a free kick in the defensive half. Attempt missed. Jake Hyde (York City) header from the centre of the box is too high. Attempt missed. Charlie Lee (Stevenage) right footed shot from the left side of the box is close, but misses to the right. Foul by Anthony Straker (York City). Attempt saved. Wes Fletcher (York City) right footed shot from the right side of the six yard box is saved in the bottom right corner.